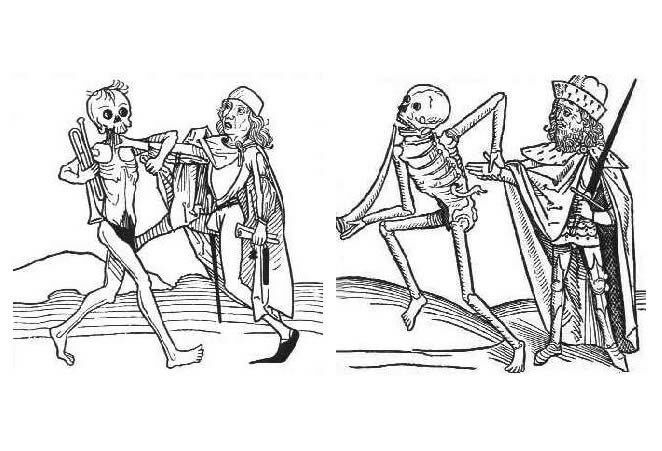 The Middle Ages was a time of horrid epidemics that had killed a great number of people. One of the biggest ones was the plague epidemic in 1348. which had killed two thirds of Europe’s population. People are often starting to think about imminence of death and briefness of life. The perception of death as the grand reaper that scythes people’s lives dates from that time. 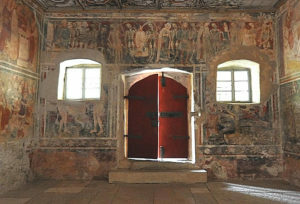 Different ideas of death are formed, which are carried over into art form. 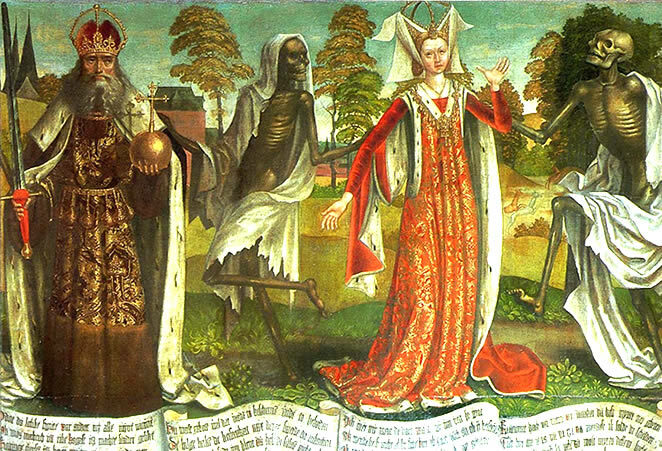 Out of a rich iconography of death, we’re outshining one example, the picturesque Dance of death. 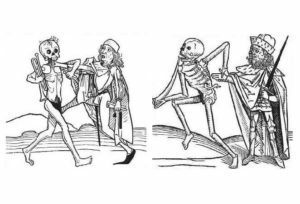 According to other opinions, medieval poetry about the immanence of death, preachings of monks (Franciscans and Dominicans), mysteries5 and superstitions6 have influenced the creation of Dance of death. 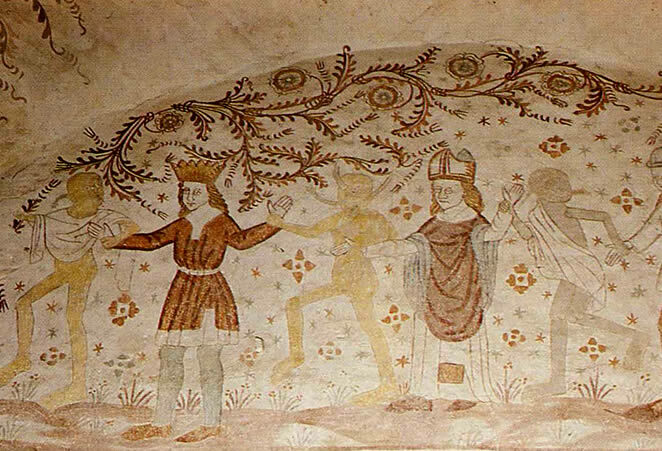 The theme became very popular in the 15th century, and what made it spread were the graphical sheets, by which it’s iconography expanded. 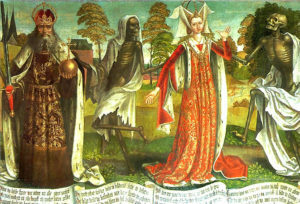 Dance of death appears on dozens of portraits in different regions of Europe. 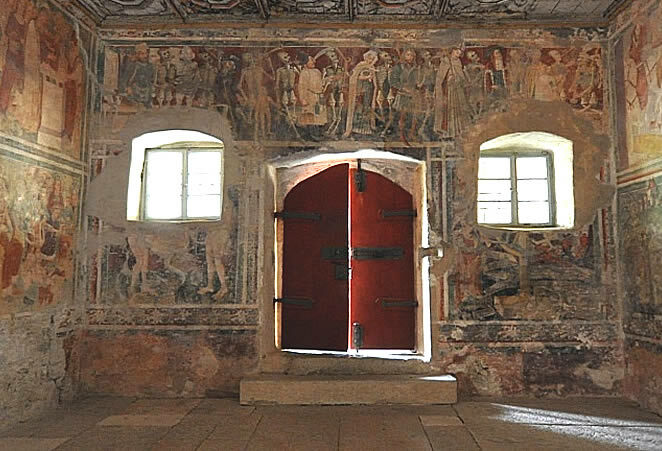 It is most often found in Central Europe (France, Germany, Switzerland, northern Italy, Slovenia, Croatia). 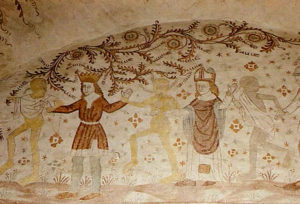 We find it painted or engraved on the outside walls of convents, family tombs, morgues or in churches.7 With these examples of Dance of death in fresco technique, we also find it presented in manuscripts. 1 ANĐELKO BADURINA (ed. ), Leksikon ikonografije, liturgike i simbolike zapadnog kršćanstva, Zagreb, 2006. [1979. ], 569. 2 ANĐELKO BADURINA (note no. 1), 570. 6 ANĐELKO BADURINA (note no. 1), 570. 8 Enciklopedija hrvatske umjetnosti, sv. br. 1., Zagreb 1995.: Beram, 79. – 80. I’ve been looking into your site and I have to say it’s been a very pleasant and interesting experience. A definite bookmark. Furthermore, I was wondering whether you could help me with any kind of information you would deem worth referencing regarding the Personifications of Death in European Art, as this is the subject of my doctorate in Art History at the Aristotle University of Thessaloniki, Greece. I am just starting to dig deeper in the subject and any worthwhile bibliographical proposals would be of much assistance. 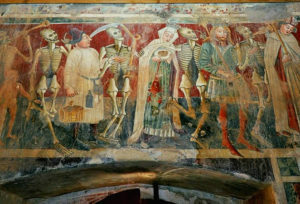 Interested in dating Hexham Abbey dance of death. It appears to be reflecting the appalling warfare of mid c15th since the death figure uses a sword and stabs down between neck and shoulder. Any thoughts?